Exposure to toxic metals, like lead, have been linked to intellectual disability, and language, and behavioral problems, but the results of studies looking at whether toxic metals influence Autism Spectrum Disorders (ASDs) have been mixed. Other metals like manganese and zinc are essential minerals important for proper development and health. Until now, one of the difficulties has been that levels of metal exposure are often only measured after a child has received an ASD diagnosis, However, Sven Bölte and colleagues realized that after a child receives an ASD diagnosis, they could determine their early exposure to heavy metals by looking at the levels of the metals in the child’s baby teeth, as they describe in a paper published last month in Nature Communications. I’m currently trying to go from working as an MD-PhD student to a science journalist. From thinking about disease and doing hands-on research to writing, thinking, and talking about those same conditions and studies. I’ve struggled to explain why I’m making this switch. To come up with a single linear narrative that’s both satisfactory and honest for the switch. Like most things, it’s complicated. I originally left the MD-PhD because of a health crisis. This gave me the time to really consider my path, and also really solidified in me something I intellectually knew but hadn’t felt before that point: that this was my one life, that I know myself better than anyone else does, and that only I can answer the question of what I should do with it. Today, I listened to a story from Science Friday about sunscreen. It’s an interesting story: sunscreen use is on the rise, but so are cases of melanoma. Why? One idea, called the ‘compensation hypothesis’ is that sunscreen with high UVB but low UVA protection, stops sunburn and enables people to spend more time in the sun. This additional time in the sun, without UVA protection therefore allows the greater accumulation of cancer-causing mutations induced by the UVA light which can lead to melanoma. That’s right, just because you’re not getting a sunburn doesn’t mean you’re not damaging your skin and your skin’s DNA. And so far, so good, this all makes sense, and is important to point out. Are inefficacious products that don’t provide UVA protection or live up to their claims – The EWG’s recommendations for the US: use products with Zinc oxide or Avobenzone that provide UVA protection and SPF 30-50. But why should we trust the EWG’s list of ‘concerning ingredients,’ over that of other groups like the FDA or American Association of Dermatology (AAD)? Today a Doctor Walked into a Hospital with an AR-15 and Shot Seven People Before Killing Himself. Will it be Counted as a “Mass Shooting?” Depends Who You Ask. Today’s horrific tragedy will undoubtedly spawn another round of news stories saying that this is the “Nth mass shooting,” or “it’s been N days since the last mass shooting in the U.S.” But many of them will give completely different numbers. When it comes to mass shootings, it can be hard to find good data—in part because in 1996 congress essentially defunded the Center for Disease Control’s research into gun violence, and in part because there is no standard definition of a mass shooting. But that doesn’t stop people from keeping count—at least five organizations track mass shootings, and this attack would not qualify as a mass shooting according to Mother Jones, or USA Today’s records of Mass Shootings. How is this possible? How can a doctor walking into a hospital with an AR-15 and shooting seven people then shooting himself not be counted as a “mass shooting?” In part, because it took place in a hospital. While deaths are clearly the most tragic outcome of a shooting, whether or not a shot was deadly does not change the motivation for the incident. In determining a mass shooting sn’t the number we care about the number that were shot at, not the number injured or dead? Why is it important shooter hit or missed their target when classifying a shooting as a mass shooting? In fact, some researchers suggest that improved treatment of gunshot wounds and the use of gun deaths as a metric has decreased our attention to the fact that gun violence appears to be rising. But expedient medical care isn’t the only reason this shooting won’t be classified as a mass shooting according to some lists. For example it probably wouldn’t make the FBI Active Shooter Report, which only count shootings that occurred in public areas, since the victims were doctors and medical students it may be counted as a workplace dispute as opposed to a mass shooting that occurred in a public space. In fact the only two organizations I could find that would definitely count this incident as a mass shooting are both crowd-sourced projects that operate online: the Mass Shooting Tracker and Gun Violence Archive. If one is concerned with general gun violence, the Mass Shooting Tracker, Gun Violence Archive, or USA Today’s mass shootings, which ignore location and motivation, may provide the most comprehensive data. However, many of the incidents they count such as gang fights or familial murder-suicides aren’t what we are typically referring to when we say ‘mass shooting.’ So if one is concerned with the seemingly random, public mass shootings other sources may be better better. And how we classify these events is extremely important if we want to study them and figure out how to stop them. Today’s story stands out more than normal to me, probably because the friends I entered medical school with just finished their first year of residency, and maybe a bit more because I’m living in New York. Any shooting, mass shooting or not is tragic, and it’s important to remember that while guns are a major public health problem in America — particularly because of their use to commit suicide — mass shootings remain a rare cause of injury or death. How rare? Well, it all depends who you ask. Trumpcare: What do the Docs say? Much of the debate over the ‘Trumpcare bill,’ also known as the American Health Care Act (AHCA), has come down to money: Republicans want the new bill to remove a tax on high-income individuals, and to raise prices of premiums and deductibles such that the Congressional Budget Office estimates would make 15 million more people uninsured next year compared with current law. The AMA is a professional organization and lobbying group, which has historically looked out for the financial interests in doctors. In this case that interest aligns with that of patients: more health care for patients means more jobs and money for doctors. Despite these groups opposition to the new bill, there is no denying the American healthcare system is in need of an overhaul. According to the OECD, the United States topped the list of healthcare spending in 2015, with 16.9% of the GDP spent in healthcare. Canada, with it’s single-payer system, on the other hand spent only 10.1%. And what are we getting for spending more than one and a half times as much on healthcare? Three years fewer life expectancy, according to the World Bank, with Canadians living to an average age of 82 compared to 79 in the US. This February, A survey, published in the New England Journal of Medicine showed only half of Primary Care Physicians had a favorable viewed the Affordable Care Act (ACA), but 95.1% stated that regulations protecting the coverage of patients with pre-existing conditions were “very important” or “somewhat important” for improving the health of the U.S. population, a provision slated to be removed according to the house’s bill. Only 15% of those surveyed wanted the ACA repealed, but 73.8% favored making changes to the law. So, yes, we need to reform healthcare in the United States, but if you ask doctors in the US, the AHCA is not the reform we need. I’d be really curious to dig into the etymology of these kinds of words, and it’s probably fairly easy to trace their emergence because they came into use so recently. Perhaps parka entered Japanese not from english but from another language where the term already had this different meaning? Or, perhaps it was originally used as a brandname for a hooded sweatshirt? Or, perhaps it’s illustrative of the nature of loan words themselves, where their lack of history makes them especially malleable and prone to mistaken meanings shortly after they’re introduced. Paper driver – Peipaa doraibaa – ペーパー ドライバー – someone who has their driver’s license but doesn’t actually drive or know how to drive well. So you might think, that these effects would just cancel each other out, but slamming on the accelerator and breaks in the car at the same time, isn’t the same as letting your car cruise. 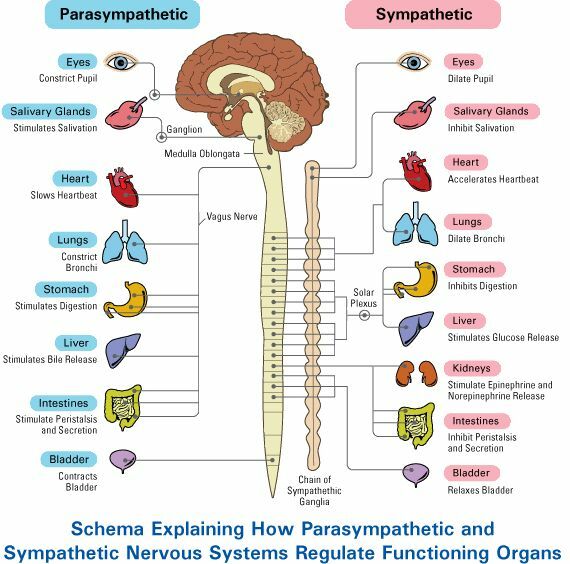 The specific effects of activating the sympathetic and parasympathetic nervous systems depend on the tissue, and the why is really gonna come down to the details, but let’s look at a couple examples first. Blood vessels are going to constrict. Because most blood vessels in the body receive sympathetic but not parasympathetic innervation. They’ve got an accelerator but no breaks. a. Shows an isolated heart receiving adrenergic neurotransmitters. B-F different strange patterns of activity (arrhythmias) observed after adding parasympathetic neurotransmitters on top of sympathetic. From Shattock and Tipton, 2012. Why is this? We have to look at what the sympathetic and parasympathetic nervous system are doing mechanistically. The parasympathetic post-ganglionic neurons (that are signaling to effector tissues) release acetylcholine. That acetylcholine can signal nicotinic and change ion concentrations, or stimulate muscarinic receptors and set of G-couple protein receptor cascades. Meanwhile, sympathetic is mostly adrenergic, though some tissues such as sweat glands are also activated using acetylcholine. How those neurotransmitters affect the effector tissues on the specific receptors are on the effector tissues, and how the downstream pathways of those receptors interact. And because receptors activation is influenced by the concentration of neurotransmitter, ‘low equal’ levels of sympathetic and parasympathetic activation may not be the same as ‘high levels’ of parasympathetic activation. This autonomic conflict occurs physiologically for example when you jump into cold water, which can activate both the ‘cold shock response’ and the ‘diving response’. An interesting article I found explores whether or not this response can generate the above-mentioned arrhythmias in people and may cause sudden cardiac arrest and death in vulnerable individuals (and which may be the true cause of deaths which are currently labeled as deaths due drowning or hypothermia). Watermelon isn’t a fruit in Japanese? And colors across languages. One nuance of language that I hadn’t considered before spending a year in Japan is how words for expressing categories sometimes don’t quite line up. For example, in Japanese ‘juusu’ or juice refers not just to fruit and vegetable juices, but also soft-drinks. But what’s more, the line between fruits and vegetables itself is different, and, yes, melons are considered vegetables in Japanese. To listen to a discussion about this, skip to minute 23:40. But, what is considered a cluster, and where the lines are drawn varies from language to language. Another classic example of this is colors. Colors lie on a spectrum of infinite minute variations, but linguistically we chop them up: yellow, green, blue, purple. But exactly where these lines are drawn, and how many basic categories there are varies between languages. For example, midori or green is a relatively late linguistic addition to Japanese and to this day fresh vegetables and traffic lights are describe as aoi which now means blue, but used to–and in these contexts, it still does–describe a set of clusters that encompassed both blue and green. And while it’s easy to say, ‘wow, that’s so strange,’ are you bothered by the fact that we don’t really have a commonly used word for sky blue/light blue/cyan ? According to Kuriki et al., 2017, this color is now often described using the word ‘mizu’ (full text article) which literally means water. And here, I’d like to switch gears and dig into this study. Psychology Textbooks Are Spreading Lies. What are the best intro psych textbooks and how to get them cheap? When Chris Ferguson, a professor at Stetson University, was trying to choose a textbook for his introductory psychology course, he realized his own field of study, video game violence was being misportrayed in some textbooks. “The data isn’t consistent or clear,” said Fergusen, but textbooks were picking sides and trying to portray it like it was. Lilienfeld is the only introductory psychology textbook that Ferguson recommends as accurate that is also used by a top psychology program. Intrigued, Ferguson decided to systematically research and publish a paper on textbook accuracy. As an intern at Gimlet Media’s Science Vs, I’ve learned a lot about making podcasts. The process of making a podcast can seem mysterious, if not impossible. And when it comes to tasks like finding the overall structuring of a story or selecting the very best audio from three-hour-long interviews, if you’re like me, you may be unsure where to even begin. Anyways, here’s my unofficial Gimlet reading lists: one of books the Gimlet office keeps on hand for newbies like me and then a second of books on nonfiction writing and journalism that Gimlet colleagues recommended to me. Comic-book writer and illustrator Jessica Abel extends and updates her classic, Radio an Illustrated Guide, interviewing the hosts and staff that create the hits This American Life, The Moth, Radiolab, Planet Money, Snap Judgement, Serial, Invisibilia, and other narrative radio shows. This book starts from the very beginning, and teaches you every step of the process of creating a story from start to finish, what sorts of big picture questions and details producers think about, and all of the weird jargon like ‘bounces,’ ‘logging,’ and ‘selects.’ And abel shows as well as telling–using the same techniques that are described in this book to make it feel more like a narrative than a dry how-to guide. Plus, it’s funny, cheap, and you’ll learn a bit about the idiosyncratic personalities who create the shows you love. What Out on the Wire does for Gimlet-style narrative stories, Sound Reporting does for more tradional NPR journalism. (Though, unfortunately, more traditional also means no pictures.) However, Sound Reporting is an audio journalism textbook written in clear conversational language by the Executive Producer for Training at NPR, and as such explains every step of making an audio news story. Not only reporting, producing, and editing, but also the ethical considerations of journalism–including examples of journalism gone terribly wrong! (For example, did you know some journalists erred and published in the 1980s that 2 million children were abducted each year, probably contributing to the long-lasting ‘stranger danger’ that still worries people today?) Sound Reporting is full of interesting, concrete examples like this, that illustrate Kern’s points and make it easy to read and understand. Reality Radio is a collection of 24 essays. The second edition is hot of the press (Feb., 2017) and includes up to date information about the rapidly changing world of radio: the ascendance of the podcast; greater cultural, racial, and topical variety; and the changing economics of radio itself. Contributors include many of the familiar faces from Out on the Wire, and a wider group including radio-makers from Canada, the United Kingdom, and Australia. The contributers are: Jad Abumrad, Daniel Alarcon, Jay Allison, damali ayo, John Biewen, Emily Botein, Chris Brookes, Scott Carrier, Katie Davis, Sherre DeLys, Ira Glass, Alan Hall, Dave Isay, Natalie Kestecher, Starlee Kine, The Kitchen Sisters, Sarah Koenig and Julie Snyder, Maria Martin, Karen Michel, Joe Richman, Dmae Roberts, Stephen Smith, Alix Spiegel, Sandy Tolan, and Glynn Washington. I took the fact that Follow the Story’s Amazon page recommends it alongside my favorite style guide Zinsser’s On Writing Well as a very good omen. Stewart is a former editor of the Wall Street Journal’s front page, and draws heavily on examples from his own writing. This may irk some, but hey, write what you know, right? As much as this is a step-by-step guide for researching and writing a story, it is a philosophy about how to following your curiosity, and then leading the reader/listener down that same journey. “Read this book if you want to be a journalist,” says Jen. Four Stars. I would have sworn a 5-star rating was coming after that unequivocal endorsement. A lot of times in radio and journalism there is no script–no one can tell you what you should be doing and that can be terrifying, and that’s without putting your life in danger. Naked in Baghdad is an example, of a journalist rising above the call of duty, who “as one of only sixteen non-embedded journalists who stayed in the now legendary Palestine Hotel throughout the American invasion she managed to deliver the most immediate, insightful and independent reports with unparalleled vividness and immediacy,” and the madness of Iraq are juxtaposed against e-mails from her husband. So there’s the start of a reading list for the aspiring radio journalist, podcaster, or audio storyteller. What books have helped or inspired you that I’m missing from the list? Leave them in a comment below or tweet me @neuroamer. And let me know if you have other questions about making podcasts or working at Gimlet.